Renton Farmers Market: Meet Me at the Market! 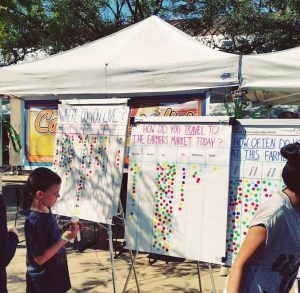 Renton Farmers Market collecting market data with help from Washington State University. We are thrilled to get in on the big city-small town feel with Renton. Follow along too via FMC Instagram! Carrie Olsen: The Renton Farmers Market (RFM) was established through grass roots community efforts and dedicated volunteers who wanted to revitalize the downtown Renton core in 2002. Today RFM is operated by the City of Renton and continues to partner with these dedicated volunteers to provide local farmers the opportunity to bring their fresh produce to our community. As members of the Washington State Farmers Market Association, RFM abides by the Roots Guidelines to determine who may sell at our market. 2017 marks our 16th season. CO: Our (suburban, outdoor) market runs June through September each Tuesday at the Piazza Park in Downtown Renton from 3:00 p.m. to 7:00 p.m. Adjacent to the Renton Transit Center means that transportation to our market is easily available to everyone. During the months of July and August, you will see many three generation family shopping outings; our plentiful seating and covered area means that the entire family can come and enjoy the sights and sounds of the market. FMC: With the market close to the Renton Transit Center, what mode of transportation do most market customers take? CO: The car is still King at the Renton Farmers Market. With the help of Washington State University Small Farms Program, we conducted a Rapid Market Assessment on July 26, 2016. One of the questions surrounded transportation to the market – in that survey question we found: in 666 responses, the vast majority (74%) of shoppers traveled to the market by car. This affirms the importance of having adequate and convenient parking for the market. An additional 15% of shoppers walked to the market and 7% arrived by bus. The market’s proximity to the Transit Center suggests that buses are an important means of transportation to the market for shoppers. The dot survey indicates that 7% of shoppers arrived by bus which may not seem as significant as driving or walking. However, among fourteen other RMAs (2009‐2012) where the same question was asked, this is the highest percentage of shoppers riding the bus that we have found. FMC: How do you generate neighborhood excitement for your market. CO: RFM serves as a community gathering spot where people have a sense of belonging and connection. Each week features live entertainment and a “Kid’s Patch” with fun and educational activities for kids and parents, as well as cooking demonstrations featuring market fresh produce. Master Gardeners help shoppers with their own gardening questions and educate them on environmentally friendly gardening practices. Our Community Booth, offered free of charge each week to non-profit groups, provides the opportunity to reach our diverse population and educate them on the services these groups provide in the Renton area. To ensure access to fresh, healthy, local foods for everyone in our community, RFM accepts SNAP/WIC/SFMNP, and participates in the Fresh Bucks SNAP Incentive program. CO: We use any and all methods we can to get the word out! Having a very limited advertising budget forces creativity…but we manage to have ads in our local newspaper, radio spots, and Facebook as our primary outlets, as well as a weekly email to our subscribers. Being a city-ran market we are able to utilize space in our Recreation and City News flyers. We also have several local businesses with reader boards that help us advertise the market! I try to encourage all of our fellow markets to support each other by liking/sharing/commenting on Facebook and other social media outlets – its a free and fast way for all of us to benefit with a larger audience! FMC: What kind of activities does the Kid’s Patch host? CO: At our official Kid’s Patch – we feature homemade play dough! The fun doesn’t stop there, however. The entire market is filled with kid’s activities – in fact we have an official Kid’s Day which falls on the first Tuesday after the end of the Renton school year. We feature extra fun on this day with kid-friendly entertainment, performances by kids, a cooking demo with kid-friendly recipes and more! We also have a Kid’s Passport, which is supported by our WSU Food $ense Extension Office. It’s a multi-week program featuring fun activities each week to encourage kids to explore the market and learn to eat healthfully – and they get prizes for participating! CO: Volunteers – with our limited budget, we rely on our volunteers to help the market run! We have volunteers that helped start the market 16 years ago, and they have the institutional knowledge that keep things running smoothly. We have also found great success partnering with our local High School Key Club to help with some of the muscles needed to get the infrastructure of the market up (and down!) each week. FMC: How has the market grown and evolved in its 16 seasons of existence? CO: What started in 2002 as a volunteer-based effort and about a dozen vendors, has grown into an event that is ran by the City of Renton, with a full-time market manager (and many volunteers!) and over 58 unique vendors. Each year we try to grow and add, always trying to adapt to the needs of our community. A few recent changes have included: an expansion of the market to include a new space we call “Market West” in 2014, this expansion has allowed us to add new vendors such as wineries and breweries as well as artisan/craft vendors, and we actually moved our Kid’s Patch there, too. One of the unintended consequences of moving the Kid’s Patch was the arrival of Dads! We know that they were always there, but it’s interesting to see that now with the move there is so much more room, and it has become quite the Dad hangout now! Most recently, we tried food trucks on the first Tuesday of the month in 2016; due to the success they are coming back each week in 2017. But far and away the biggest change was the addition of the EBT token program in 2015, and then adding the Fresh Bucks Incentive program in 2016. The Renton Farmers Market had always participated in the Senior and WIC FMNP, and with our high rate of redemption (among the highest in the state) we knew there was a need to expand access. This was a huge undertaking, due to some unique constraints of being a City operation. But after lots of work we got it done, and are proud to be the first City-ran market in our state to offer an EBT token program, and subsequently the Fresh Bucks Incentive!